The folks over at Look Insurance have launched an interactive map of "hidden gems" across the UK and asked me to contribute (see here)! It's a great idea; particularly for those who are looking for something a little more off-the-beaten-path. And although this isn't entirely hidden, it's certainly one of my favorite places in the world: Bodysgallen Hall in Llandudno, north Wales. At first glance, it's like every other historic house that's been turned into an award-winning hotel: acres of beautiful landscaped gardens and grand, sweeping views of Snowdonia. But to me, it's so, so much more. After all, it's where John and I spent our first weekend as a married couple after we eloped (yes, eloped!) to Llandudno two years ago. The Hall played a pivotal roll in making our wedding day absolutely perfect and since then, it's held a very special place in my heart. 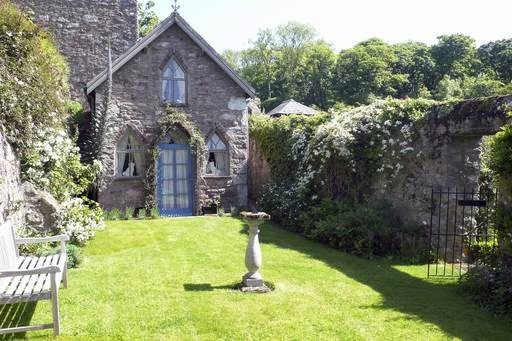 Built in the 17th century (but with a 13th century tower that was once used as a lookout for the soldiers serving the English kings of Conwy - for all you history buffs), the Hall is now comprised of 15 bedrooms in the main house and 16 other cottage suites on the grounds. John and I first stayed in the Gingerbread House (I adore that name! Can you tell?) about four years ago and fell in love with the cottage, the Hall, and its romantic grounds, which consists of both landscaped gardens and a woodland park where you can easily go for a dusk stroll (me) or enjoy a morning run (John). Though it's a bit of a trek, you can also walk from the hotel to the small seaside town of Llandudno (where we were married) and Conwy Castle, which is really fun to explore. Or, if you're in the need of pampering, the hotel also has a small but fabulous spa, which is well equipped with a pool, jacuzzi, sauna, and steam room. I had a positively amazing Indian head massage there during our first visit and didn't want to leave! The sweet little cottage that we were staying in was so fun to be in, we decided to order room service every night and watch TV together, snuggled up on the couch, until the early morning hours before taking a walk through the woodlands. Having a drink in the hotel bar or dinner in the main dining room is like stepping back in time: a grandfather clock chimes at each hour (or so I remember), there's a separate library for reading the paper or catching up on a favorite book, and the bar is stocked with a venerable list of whiskeys and spirits (but likewise, they won't blink if you ask for a Diet Coke with ice). Afternoon tea is taken in the oak-paneled drawing room, where you're served wherever you'd like to be seated: whether that's next to the fireplace or next to one of the beautiful stone mullioned windows (I seriously don't even know what "mullioned" means, but I can tell you that the windows are exquisite). Fun fact: afternoon tea at Bodysgallen includes bara brith - a Welsh fruitcake, as well as traditional scones, finger sandwiches, and other sweet cakes. And - you'll either hate this or love it - the Dining Room has a dress code. As you can tell, I happen to love this. I think dressing up for dinner (on occasion!) is so civilized and often necessary. Plus, it's fun! And the dress code isn't anything too stuffy or crazy - they simply ask you to refrain from wearing trainers (sneakers) or tracksuits (sweats) to dinner. Who shows up to a nice restaurant wearing sweats anyway?! Though I spoke before of over-indulging in the room service menu, I've eaten at both the main Dining Room and the less formal 1620 Bistro, which is equally delicious. But what I haven't mentioned, and what has probably been the most important aspect of my stays at Bodysgallen Hall, is how incredibly wonderful the staff is. From our very first visit, it was clear that we were by far the youngest guests at the historic mansion - but we received the same respectful and polite service as every other guest staying at the house that weekend (unlike other establishments we've been to and won't be returning to any time soon). Our wedding day was made perfect by the hotel manager and staff, who did everything they could to make it special. We were greeted upon our arrival by the hotel manager, who ensured that we had our favorite Gingerbread House for our stay (as I had requested) and had champagne and a hand-written note waiting for us ahead of our arrival. I had asked the hotel if I could "borrow" a small bouquet of flowers from their grounds to take with me to the Conwy Registrar's Office for our ceremony and they had their florist prepare a bespoke bouquet for me, which was absolutely beautiful and which I still have! On the morning of our ceremony, I was getting ready alone in the cottage, putting on my dress and doing my hair and makeup, when I heard a knock on the door: it was one of the porters, who handed me a gift-wrapped box from Links of London containing a pair of pearl earrings that John had arranged to be delivered to me that morning while he went for a run. So sweet! Though our stay that weekend was incredibly short, I'll never forget how kindly we were treated. And when I squeeze my eyes shut to travel to one of my few "happy places" in the world, Bodysgallen Hall is always on the list. This is my hidden gem, and one that I think you should definitely visit. All photos courtesy of the Bodysgallen Hall website. I never knew this place existed, it looks absolutely wonderful though!